Aerogel as high performance insulation? Aerogel was invented 1931, it is a porous solid material that is strong and does not conduct heat. Composed almost entirely of gas, which is a poor heat conductor, aerogel can almost nullify the three methods of heat transfer (conduction, convection and radiation). Boasting an R-value of 10 to 30, NASA has used the material to protect astronauts and equipment, such as the Mars Rover, from the extreme cold of space. As compared to conventional insulation material, the R-values of vermiculite, rockwool, fiberglass and cellulose are approximately 2.13, 3.1, 3 and 3.1, respectively. Silica aerogel is especially valuable because silica is also a poor conductor of heat. A metallic aerogel, on the other hand, would be less useful as an insulator. To read the full story click on InterNACHI link below. One item I inspect in my home inspections is for the use of single strand aluminum wiring that was used in place of copper wiring between 1965 and 1973 . This is a serious fire hazard. According to the Consumer Product Safety Commission (CPSC), “Homes wired with aluminum wire manufactured before 1972 [‘old technology’ aluminum wire] are 55 times more likely to have one or more connections reach “Fire Hazard Conditions” than is a home wired with copper.” Here is a good reference on repairing aluminum wiring. The presence of single-strand aluminum wiring may void a home’s insurance policies. FireFree® Plus PMFC (Polymer Modified Fiber Cement) roofing, which is rated a Class A fire-rated material, is made from a blend of cement, cellulose fiber and aggregate materials. The individual roof tiles are coated with a polymer resin that penetrates below the surface layer and encapsulates all six sides of the material. The roofing shakes in question were manufactured between 1993 and 1997, and are now off the market. The two product lines of FireFree® Plus roofing — Rustic Shake and Quarry Slate — were produced in a limited variety of colors. The Rustic Shake line was molded to resemble rough-sawn or split cedar shake, and the Quarry Slate line was molded to resemble traditional slate roofing. As with all cement-based products, FireFree® roofing products are subject to breakage due to the fact that the products cure longer than others. This results in a slightly stiffer product that is more capable of withstanding breakage usually associated with shipping, delivery and roof loading. However, the materials are more brittle, which presents breakage concerns during installation. Because the tiles are tapered from the bottom edge to the top, they are more brittle at the top. Breakage may occur if walked on, even by experienced roofing specialists or contractors. Under common roofing conditions, this is not a problem as the top of the tile is covered by the next applied row. However, a edges can exist when the tiles are installed in a valley, which can leave the top edges and untreated cut exposed to the elements. In order to positively identify problems, the tiles must be removed, and problem replacement or repair is rather difficult. Photo below was taken during a home inspection in Colorado Springs. Woodruf™ roof shingles, a fiberboard roofing product, were a Masonite™ roofing product consisting of “pressure bonded fibers designed to resemble natural cedar roofing” sold in the United States into the 1990′s and have also been found installed on homes in Canada. The roofing shingle product was produced in four-foot sections that were 12″ wide and with a nominal thickness of 7/16″. The actual thickness varies due to raised ridges that give Woodruf™ shingles the appearance of a wood shake or shingle. Our sources indicate that Woodruf™ shingles were marketed with a 40 year life expectancy. As of this article’s last update (July 2010) there is no warranty service remaining on this roofing product. The Woodruf™ shingle fiberboard was treated with a water repellant and a bonding agent to permit outdoor exposure. This product is softer than Masonite’s hardboard products and to remain durable required an installation that permitted good roof drying (similar to the requirement for wood shingles or shakes). This is particularly true because the factory edges as well as any cut edges made during installation were not sealed. Masonite Woodruff roofing was intended for steep slope roofs and should not be installed on slopes lower than 4″ of rise in 12″ of run (a 4/12 roof). The shingles were to be installed over roofing felt on a sound roof deck, with a 9″ shingle exposure and requiring eight nails per roofing panel. T-lock shingle is an interlocking shingle that doesn’t have a tar strip but instead uses an interlocking design to hold them in place. T-Locks have been widely believed to be more wind-resistant than seal-down shingles because of the overlap system, but they are frequently assigned the same tested wind-resistance rating as a 3-tab or architectural shingle of the same warranty period. T-Lock shingles have been discontinued by the manufacturer and can no longer be repaired as material is no longer available. T-Lock shingles were discontinued in 2006 and as such trying to find replacement shingles for your roof is next to impossible. Photo seen below was taken in Colorado Springs. Initially launched in November 2010, the DOE’s Home Energy Scoring Program is aimed at “…giving American families the tools they need to invest in home energy upgrades,” according to Vice President Joe Biden. The program’s ultimate goals include putting less demand on public utilities and natural resources, and helping homeowners save money on their energy bills, which will potentially make them eligible for discounts on home supplies and even insurance coverage. The Home Energy Score will be a quick way for homeowners to understand how their home’s energy performance compares to that of others in the same region. 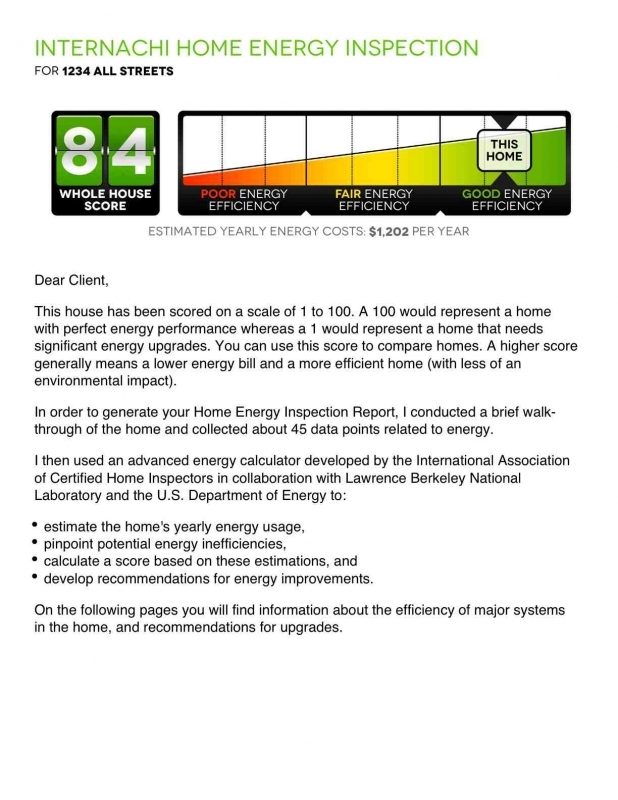 And, the Home Energy Score will be more than just a simple number or label. Along with the score will come customized recommendations for simple energy upgrades, intensive energy audits, as well as an estimate of how much energy improvements can reduce the homeowner’s utility bills. Homeowners often find that energy improvements can dramatically improve the comfort and integrity of their homes, so it makes sense for homeowners to act as soon as possible to enhance their quality of life. Using the InterNACHI Energy Rating, home inspectors can assess areas in the home for energy improvement and make specific, cost-effective recommendations to clients so that they can develop a specific plan of action to address their home’s energy deficits. Whether they’ve lived in their home for years or have just moved in, all homeowners and prospective homeowners can benefit from a home energy inspection. By getting an InterNACHI Energy Rating performed by a specially trained InterNACHI inspector, homeowners can quickly learn how to save energy and money, while also seeing how their home ranks compared to others in the area. After the homeowner makes energy improvements, the home’s energy efficiency is likely to increase. So, similar to radon testing that is performed both before and after mitigation, homeowners can ask their contractor to include a post-upgrade assessment as part of the energy improvement package to compare pre- and post-upgrade scores. An InterNACHI Energy Rating can help homeowners understand how to integrate energy upgrades into a home renovation project or addition. When done as part of a larger project, it makes sense to have the home inspected before and after work is done so the homeowner can verify that the home’s energy performance has improved. The Rating serves as a way to document these improvements, thereby enhancing the home’s appeal and value when it’s ready to sell. To perform a Home Energy Inspection, the inspector conducts a brief walk-through of the home and collects 45 data points related to home energy. develop recommendations for energy improvements. The house is scored on a scale from 1 to 100. A 100 would represent a home with perfect energy performance whereas a 1 would represent a home that needs significant energy upgrades. This score can be used to compare homes. A higher score generally means a lower energy bill and a more efficient home (with less of an environmental impact). splash block or a paved drainage chute is needed. Water that ﬂows directly off a roof lacking gutters and downspouts can cause damage below. Accordingly, some provision in the landscaping may be needed, such as a gravel bed or paved drainage way. The rule of thumb for downspouts: at least one downspout for each 40 feet (12 m) of gutter. For roofs with gutters, make sure that downspouts discharge so water will drain away from the foundation. Downspouts can be checked for size. Seven square inches is generally the minimum except for small roofs or canopies. There should be attachments or straps at the top, at the bottom, and at each intermediate joint. Downspout fasteners can rust, deform, fail or become loose. On buildings with multiple roofs, one roof sometimes drains to another roof. Where that happens, water should not be discharged directly onto rooﬁng material. The best practice is to direct water from higher gutters to discharge into lower gutters through downspout pipes. Wooden gutters are especially susceptible to rot and deterioration and should be monitored. Pitched roofs in older buildings may end at a parapet wall with a built-in gutter integrated with the roof ﬂashing. At this location, drainage is accomplished by a scupper (a metal-lined opening through the parapet wall that discharges into a leader head box that in turn discharges to a downspout). The leader head box should have a strainer. Check the scupper for deterioration and open seams. All metal roof ﬂashings, scuppers, leader head boxes and downspouts should be made of similar metals. Homeowner maintenance includes cleaning the leaves and debris from the roof’s valleys, gutters and downspouts. Debris in the valleys can cause water to wick under the shingles and cause damage to the interior of the roof. Clogged rain gutters can cause water to flow back under the shingles on the eaves and cause damage, regardless of the roofing material. This condition can occur with composition shingle, wood shake, tile or metal. In the winter if drainage systems are clogged this moisture that has wicked under the roof covering can create a ice dam and cause damage to your roof system. Inspect the downspouts to make sure they are clean, clogged downspouts will cause the same damage.If downspouts are underground, make sure the area of discharge is cleared of grass and other plant material. If the discharge area is blocked water can back up into the downspouts also creating an ice blockage and eventually into the gutters and cause the same ice dam issues as described above. evidence of ice dams and look at the eaves and sofﬁt for evidence of deterioration and water damage. If the house has an attic, the underside of the roof deck at exterior walls can be checked for signs of water intrusion. Safety: Don’t forget about safety when cleaning your gutters. Garage doors are one of the heaviest moving objects associated with your home. They are supported and operated by large springs and openers which control the opening and closing of garage doors, either through a wall-mounted switch or a radio transmitter. Due to the strain that garage door components and openers regularly endure, they may become defective over time and need to be fixed or replaced. Defective components may create safety hazards as well as functional deficiencies to the garage door assembly. The majority of the injuries caused by garage doors are the result of pinched fingers, although severe injuries and deaths due to entrapment occur as well. Sixty children have been killed since 1982 as a result of garage doors that did not automatically reverse upon contact. All garage doors should be equipped with a manual emergency release handle, which will detach the door from the door opener when activated. It is vital during emergency situations, such as when a person becomes trapped beneath the door or when a power outage cuts electricity to the door opener. Activate the handle to make sure that it works, although you will have to reset the handle if it does not reset automatically. In order for the handle to be accessible and obvious, the handle should be red in color and hang no higher than 6’ above the garage floor. Photoelectric sensors or Photoelectric eyes are located at the base of each side of the garage door and emit and detect beams of light. If this beam is broken, it will cause the door to immediately reverse direction and open. For safety reasons, photo sensors must be installed a maximum of 6 inches above the floor surface and should be tested periodically. This safety feature can be tested by grasping the base of the garage door as it closes and applying upward resistance. Use caution while performing this test because you may accidentally damage its components if the door does not reverse course. Door parts should be checked for loose door guides,rollers & hinges, because of extreme pressures on these parts the guides and hinges can become loose or the rollers worn. Make these inspections a part of your annual maintenance inspections or have a Certified Home Inspector conduct an Annual Home Inspection. Sump pumps are self-activating electrical pumps that protect homes from moisture intrusion. They are usually installed in a corner of the basement or in a crawlspace. They are designed to to remove rising groundwater and surface runoff before it has a chance to seep into the home. Water can cause interior damage and encourage the Mold growth. Sump Pumps should be maintained and equipped with all necessary components in order to ensure their reliability and be tested to ensure proper operation. Sump Pumps are one component I check during my Home Inspection. Submersible sump pumps are designed for underwater use and sit at the bottom of the sump pit, and are much quieter than pedestal pumps. Their oil-cooled motors and tight seals protect against water and dust and afford them a long lifespan. Sump Pumps can be purchas ed from your local home improvement stores from about $150.00 to $400.00 which is a small price to pay considering the possibility of moisture in your basement or crawl space leading to Mold Growth. Pedestal sump pumps sit above the water line beside the sump trench and are not designed to get wet. Since they are not contained within the sump pit, they can be accessed easily but are also very noisy. Sump pumps must be kept clean and free of debris. The inlet screen prevents the passage of dirt and other solid material from entering the pump. Cleaning the screen should be a part of regular maintenance. You should make sure that the float is not tangled or jammed in one position. The float should be free to move up and down. Raise the float and the pump motor should start, lower float and it should stop. A sump pump with a jammed float is useless because it will not sense when it should turn on and shut off. The pump can be tested by pouring water into the pit to make sure it becomes activated and expels the water. Depending on the size and design of the pit and how fast the water peculates into the ground this procedure can take quite a few gallons of water. For most homes, the sump pit should not be less than 24 inches deep and 18 inches wide. The sump pit must be large enough to allow the pump room to work properly. The sump pit does not need to be constructed from any particular material, as long as it is solid and provides permanent support for the pump. It must, however,. Some homeowners use a 5-gallon bucket as a sump pit, but this is insufficient. The check valve must be the same diameter as the discharge pipe into which it fits and is usually a different color. A check valve should be installed in order to prevent pumped water in the discharge line from re-entering the sump pit when the device is turned off. Without this valve, the pump will have to work twice as hard to remove the same column of water, which causes unnecessary strain to the pump components. A check valve can also prevent the rare yet disturbing possibility that a discharge line connected to a stream or pond will back-siphon into the sump pit. These Items will be checked by a Certified Home Inspector if you are purchasing a home with a sump pump installed. An alarm can be installed because sump pumps can burn out, lose power, become clogged or misaligned, or malfunction in a variety of other ways. It is valuable to have a warning device installed that will signal water build-up. These alarms can alert homeowners or neighbors of flooding so that it can be resolved before water damage occurs. Alarms are especially important in residences that are not occupied for long periods of time. Backup Power sources can be installed to maintain operation during power outages which are most likely to happen during heavy rains and floods, which are situations when the sump pump is most needed. For this reason, sump pumps should have a backup power source to rely on. A pump powered by a battery or the home’s water pressure can also be installed as a backup. A GFCI receptacle can be used but may trip during safe conditions and deactivate the sump pump when it is needed. A sump pump is among the most critical of all household appliances, and its deactivation, especially if the tenants are not home, could allow catastrophic building damage. Codes recommend that appliances in basements and crawlspaces be connected to GFCIs to reduce the chance of electrical shock, but this advice is often ignored due to these concerns over nuisance tripping. Point of discharge should be 20 feet from your foundation and should have positive drainage from your wall or foundation line. Water should not drain onto your neighbors property and in most areas is not permitted to drain into the sewer system or septic system. If you own a home or are planning to buy a home built before 1978, here are some facts you should know about lead. If you think your home might have lead hazards, consider having your home tested for lead paint to protect your family. • in drinking water. Your home might have plumbing that uses lead pipes or lead solder. Call your local health department or water supplier to find out about testing your water. You cannot see, smell or taste lead, and boiling your water will not get rid of lead. • Run water for 15 to 30 seconds before drinking it, especially if you have not used your water for a few hours. • with hobbies that use lead, such as making pottery or stained glass, or refinishing furniture. • Bullet re-loading using lead. • in folk remedies that contain lead, such as “greta” and “azarcon” used to treat an upset stomach. • If you rent, notify your landlord of peeling or chipping paint. • Clean up paint chips immediately. • Clean floors, window frames, window sills, and other surfaces weekly. Use a mop, sponge or paper towel with warm water and a general all-purpose cleaner, or a cleaner made specifically for lead. REMEMBER: NEVER MIX AMMONIA AND BLEACH PRODUCTS TOGETHER, SINCE THEY CAN FORM A DANGEROUS GAS. • Thoroughly rinse sponges and mop heads after cleaning dirty and dusty areas. • Wash children’s hands often, especially before they eat, and before nap time and bed time. • Keep play areas clean. Wash bottles, pacifiers, toys and stuffed animals regularly. • Keep children from chewing window sills and other painted surfaces. • Clean or remove shoes before entering your home to avoid tracking in lead from soil. • Make sure children eat nutritious, low-fat meals high in iron and calcium, such as spinach and dairy products. Children with good diets absorb less lead. •In addition to day-to-day cleaning and good nutrition, you can temporarily reduce lead hazards by taking actions such as repairing damaged amid painted surfaces, and by planting grass to cover soil with high lead levels. These actions, called “interim controls,” are not permanent solutions and will need ongoing attention. To permanently remove lead hazards, you must hire a certified lead-abatement contractor. Abatement (or permanent hazard elimination) methods include removing, sealing or enclosing lead-based paint with special materials. Just painting over the hazard with regular paint is not enough. Always hire a person with special training for correcting lead problems — someone who knows how to do this work safely and has the proper equipment to clean up thoroughly. Certified contractors will employ qualified workers and follow strict safety rules set by their state or the federal government. To be safe, hire an InterNACHI inspector for your next inspection. From the perspective of 28 years in construction management (superintendent), job site safety was always foremost on my mind. When an accident occurs on a job site it can be very costly in many ways. First to the injured party who must suffer through the healing process, it also cost the project time due to possible re-staffing, time taken in investigating the accident and the insurance rates sometimes will go up. In my Home Inspections I am not looking for things like household chemicals or plants, I concentrate on electrical issues or fall type hazards. Just as a project superintendent would have a safety plan, so home owners should also have a plan in case of accidents of any kind. Remember the faster you can respond to an accident the better for the victim (your loved one). Buying a home is the first step, you have most likely had it inspected for structural and electrical problems hopefully by a Certified Inspector. Don’t stop there, as you move into your new home keep in mind the safety of your family. If you have small children consider cabinet latches and keep the poisonous plants out of reach. As I was considering my own home safety, I was astonished at the number household items considered to be poisonous either by ingestion or inhalation. Items we use sometimes daily but don’t stop to read the labels. Safety does not stop with household chemicals, it also includes electrical, trip hazards and even house plants. To my surprise I found the following list of indoor plants to be poisonous. Items in the kitchen considered poisonous: glass cleaner, antibacterial cleaner, dishwashing detergent, all-purpose cleaner, insect sprays, oven cleaner, and ant or roach baits. Items in the bathroom considered poisonous: medicines, toilet cleaners, antibacterial cleaners, air fresheners, drain cleaners, mold and mildew remover. Items in the garage considered poisonous: motor oil, windshield washer fluid, gasoline, paints, auto batteries, antifreeze, pesticides. Don’t force to vomit immediately. Call poison control. Tell them what substance and how much was swallowed. Take the bottle or package to the phone when you call. Directions on the container may not be up to date. Always follow the instructions given by the poison control center. Do not give the patient fluids or cause to vomit if unconscious or in convulsions. Call for emergency help. Immediately cool the burn area by putting it under cool running water or in a sink filled with cool water for at least five minutes or until the pain subsides. Never apply butter, grease or ointment. Don’t open blisters or remove dead skin. Cover with gauze. If blisters break, apply a clean dressing. If the burn is on the face, covers an area bigger than your hand or if it blisters, call the doctor or emergency number. MINOR – Wash wound area with soap and water, not alcohol; cover with a sterile gauze bandage. cloth or towel and press hard on the cut for 10 minutes. Do not remove pressure to see if it’s working. If possible, raise the cut above the level of the chest. After 10 minutes, if the bleeding has stopped, cover the cut with a bandage. If the bleeding hasn’t stopped, try pressing harder for five more minutes and seek medical help. Make sure you have the following posted near your phone in case of an emergency. Do I have Polybutylene Plumbing in My Home? Polybutylene Plumbing – Be aware Home Owners and Home Buyers. Polybutylene piping was a low-cost piping formed of plastic resin and is a very common negotiation strategy for home buyers looking for home in my part of Colorado. It is commonly gray, white, blue, black and ivory in color and is flexible as the photos show. Poly piping was used as a substitute for copper piping in both underground water mains and interior plumbing. One of the easiest ways to identify this pipe is to locate the “PB” lettering on the printed label. Because of the ease of installing poly piping, it was used in the construction of millions of homes throughout the U.S. between 1978 and 1995. Not all polybutylene piping systems use polybutylene fittings; some use copper. Therefore, if you see copper fittings on a pipe, it does not mean that you do not have poly piping. The following photos have been taken in my Home Inspections and are of Polybutylene piping. It was discovered that as poly pipe ages and reacts with the oxidants in normal tapwater, it becomes brittle, sometimes scaling or flaking. This results in a fracturing of the interior surface of the pipe, which allows for more deterioration. Eventually the pipe will begin to leak, causing damage throughout a home. Poly pipe with plastic fittings or with metal fittings will eventually incur damage; poly piping is not a reliable piping under any circumstances. If a pipe has been leaking for some time without the knowledge of a homeowner, severe structural damage or Mold growth can result, making repairs extremely difficult. Polybutylene piping was the subject of much attention because of the settlement of a multi-million dollar lawsuit. Manufacturers of PB pipe have never admitted that it’s defective, but they have agreed to fund the class-action settlement. Polybutylene pipe is no longer be manufactured and is no longer be available . For more information visit The Polybutylene Pipe Settlement Fund http://www.pbpipe.com/. The Cox v. Shell settlement was one of the largest consumer settlements in United States history. The only way to eliminate the possibility of problems that can come from deteriorating polybutylene piping is to replace the pipe itself. Fortunately, this procedure is relatively inexpensive and can usually be performed by a certified plumber or re-pipe specialist. A reputable plumbing company can install water supply piping professionally, but can they do the whole job for a fair price and at the least inconvenience to me? A few general plumbing companies will do the whole job by subcontracting the drywall and paint, but a re-pipe specialist is your best. They have the personnel to give you a quality job, and they will do it more efficiently, with less damage and inconvenience, and most importantly, for less cost. In general, real estate agents tell us that homes with polybutylene piping sell for less and take longer to sell. Generally, a home inspector flags the problem, and the pipes are replaced before closing. But we do not know how many prospective buyers simply ignore homes with poly because they recognize it as a potential problem from the start. So if you discover your home has Polybutylene piping have it replaced, the possibility of a leak or rupture occurring will only increase with time. Make sure your home inspector is aware. Contact me if you have any questions. Mr. Myers corrects the reader stating that the seller only has to disclose ‘KNOWN” defects and that a professional home inspector knows how to FIND these defects (my emphasis) – well worth a few hundred dollars since a professional home inspection is “Cheap Insurance.” A home inspection (or commercial property inspection) is both cheap insurance and a powerful price negotiation tool for both the buyer and seller of a home worth hundreds of thousands of dollars. It can keep you out of court where your you may or may not collect damages for property defects. “For example, say you purchased a house without ordering an inspection, and it slid off the foundation when the first rainstorm arrived, the only way you could collect damages from the seller would be to prove that he knew about the problem – or at least should have known – and failed to disclose. At best, you would have to spend thousands of dollars in legal fees and countless hours in court pursuing a claim with an uncertain outcome. Like he said, “cheap insurance.” It certainly makes me feel pretty good about my career choice and the value that I can provide my clients with my years of construction and inspection experience. I know that I have helped people avoid some major problems in buying or selling a home and I am proud to be a NACHI Certified Home Inspector. Remember all “Home Inspectors” are not created equal, find a Certified NACHI Inspector to get the best value for your money. Here is a little more current article that discusses the return on the investment that you get from using a certified Home Inspector entitled, “Ten Reasons You Shouldn’t Skip a Home Inspection“. Carpeted Bathrooms is it a Good Idea? Probably 30% of the homes I inspect have at least one bathroom that has carpet. Here are some things to think regarding bathroom flooring. Carpet or not? Carpet has a warmer look to the bathroom. When left to grow mold can create structural damage, because mold can deteriorate a wood sub-floor or drywall and cause structural damage which can lead to costly repairs. Carpet has a tendency to hold or foster bacteria which is one reason it is against code to carpet a commercial bathroom. The photo is of a bathroom that was tiled but moisture invaded the ceramic tile and went unchecked mold growth occurred and lead to costly repairs. Should My FPE Stab-Lok Panel be Replaced? Since I see these fairly frequently during home inspections, I did some further research on these panels from the experts.. In a class action lawsuit, a New Jersey State Court ruled that the Federal Pacific Electric (FPE) Company “violated the Consumer Fraud Act because FPE knowingly and purposefully distributed circuit breakers which were not tested to meet UL standards. An expert who investigated the potential hazards of Federal Pacific Electric panels stated under UL 489 test conditions, that FPE panels fail to trip at a much higher rate than standard panels. Using UL 289 test conditions, the Consumer Product Safety Commission (CPSC) found that Federal Pacific Electric panels may be unfit for homes. The materials used to construct the breakers may be weak. As a result, the breakers may not trip, and the panel could be susceptible to catching on fire. Most breakers in a home are never called upon to trip, and the homeowner’s perception is that ‘the breakers work fine.’ The same observation could generally be made if there were no breakers (or fuses) at all, just a hardwired system. In the event of an electrical malfunction, however, our safety may depend on proper operation of the circuit breakers. The presence of a Federal Pacific panel in a home should be classified as a ‘Safety Defect.’ The Federal Pacific breakers are primary safety devices of questionable operating reliability. The breaker’s function is to stop certain electrical sequences that could, if allowed to proceed, lead to fire in the building. If an electrical fire hazard develops somewhere in the building, the breaker is supposed to trip and minimize the possibility of fire ignition. If the breaker is defective, fire is more likely to result. There appear to be two options for correcting the hazards of having this panel in your home, First is total replacement and second is an Adjustable Retrofit Kits produced by Eaton Corp., Cutler Hammer Products (E-CH) are a patented design new electric panel interior designed to replace aging electrical panels in residential and light commercial applications. Here is a website with lots of information on the Federal Pacific / Stab-Loc panels . Please contact me if you have any questions or need an experienced home inspector to help you with your home purchase or sale.